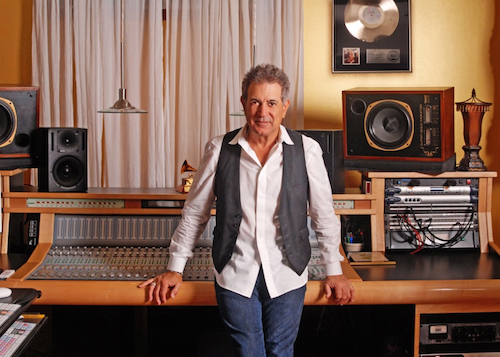 Meet Grammy Winning Producer Val Garay. With record sales totaling a hugely impressive 125,000,000 worldwide, he has worked with everybody who’s anybody in the recording industry. In 1982 he shared a Grammy Award for 'Record of the Year' with Kim Carnes, for the record "Bette Davis Eyes". He has received numerous entertainment industry awards and additional Grammy nominations including 'Best Engineered Recording' for his work on the James Taylor album "JT" and Linda Ronstadt's "Simple Dreams," a Grammy nomination for 'Album of the Year' for Kim Carnes "Mistaken Identity," a Grammy nomination for 'Producer of the Year', an Emmy nomination for 'Best Engineered Recording' of a TV Special for Neil Diamond's "Glad You're Here With Me Tonight," as well as dozens of gold and platinum records. Tell us a bit about how you got into production. You started life as a singer/songwriter but what made you make the transition over to the studio environment full-time? I was in and out of bands all through the late 60’s and early 70’s and it became obvious to me that my life was dependant on 3 or 4 other people. The only way I’d be able to have any independence would be to start engineering and producing myself. So I was given the opportunity to start working under a very famous engineer at the time - Dave Hassinger. I’m currently working with artists such as Carmel, a singer/songwriter from the bay area, The Ceremonies - a rock band signed to Troy Carter, Adam Esrick - an Americana artist, Wouter Kellerman - an incredible South African flautist who just won a Grammy for ‘Best New Age Album’, Shani - a young pop artist and Shirley Levi - an indie rocker. "I use VocALign to tighten harmonies and doubled vocals, and frankly I couldn’t live without it. It would take days of strenuous tracking to get harmonies that tight. I also use Revoice Pro to create double vocal parts and harmonies. It saves me lots of time and energy, which can be spent elsewhere." What was it like working on Steven Spielberg’s ‘Little Giants’ and what was your role exactly? I was the music supervisor on that film and placed all of the songs. I had a pretty free reign when it came to the choosing the music from Steven’s end. I also introduced a new band out of Nashville that had just done their first album at the time and hadn’t really broken yet. They were called The Mavericks. I thought they were amazing and went on to achieve platinum status. How did it feel to win a Grammy? About as unbelievable a feeling that I’ve ever had in my entire life! Which Synchro Arts products have you been using for audio processing and why? I use VocALign to tighten harmonies and doubled vocals, and frankly I couldn't live without it. It would take days of strenuous tracking to get harmonies that tight. I also use Revoice Pro to create double vocal parts and harmonies. It saves me lots of time and energy, which can be spent elsewhere. No other product allows me to tighten vocal takes and create double and harmony tracks with the amount of versatility and flexibility as the Synchro Arts products do. "Trust your instincts and your ears. That's what got you there in the first place!" Is there a particular ‘go-to’ feature you keep going back to our product for? The vocal doubler feature of Revoice Pro is a common ‘go to’ feature for me. After working with such an impressive rosters of artists over the years, what’s the most valuable piece of advice you would pass on to audio professionals just starting out? Trust your instincts and your ears. That’s what got you there in the first place! I always like to try new products and new ideas, but I always seem to go back to most of my tried and true solutions. Synchro Arts is one of those tried and true products. Thanks for your time Val - it's always great to hear from an industry legend such as yourself and learning about how you use our products! Read more about Val over on his website.